YARN BOOBIES NOW IN MALTA! At Jacob’s Brew besides donating a percentage of our profits to our NGO Survivors Malta to help fund projects to better the lives of families facing trauma, we also encourage other entities/NGO’s to use our back room at the shop (our meeting hub) for support meetings and other community activities. One such initiative is Craft&Coffee For Charity which was founded a year ago. It is the brainchild of Becky Pace Bajona and began with just a few members gathering together in the meeting hub crocheting lap blankets for the elderly made from donated wool dropped off at Jacob’s Brew and today with the help of fellow founder member Valerie Mckay the group has grown to 30 talented ladies who dedicate their time selflessly to crafting items for charity. To date they have donated items not just to several retirement homes, but also to YMCA, HOSPICE MALTA, PASSI & BEYOND and AURORA SUPPORT SERVICES. With many other projects in the pipeline there is no stopping these amazing ladies. 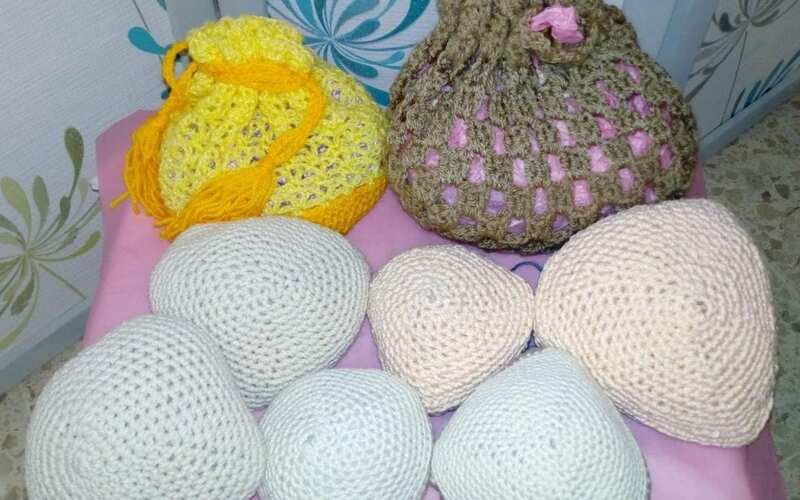 One such project is the theYARN BOOBIES; an idea that came about at a meeting with Cancer support group AURORA when Craft&Coffee For Charity were offering crocheted PAMPER POUCHES to them at their pamper sessions for cancer patients undergoing treatment at Oncology. They had shown Becky a sample yarn boobie which apparently are used in UK and America to fill out bras of breast cancer patients after undergoing mastectomies. After a trial Yarn Boobie was successfully tried and tested, the ladies at CCC decided to crochet even more Yarn Boobies (20 to date) and will be launching them here in Malta on Monday 29th October at our coffee shop Jacob’s Brew, distributing them to breast cancer survivors in collaboration with AURORA, EUROPA DONNA and ABCF support groups. Why not share the knitting instructions.? It might not be convenient for everyone to join the knitting/crochet group but they might have the time to knit at home. Goods could then be brought to Jacob’s Brew or to where they are needed. It’s such a good idea! Hello Josephine. Thank you for your interest. Craft&Coffee For Charity is also a social group where the ladies have found friendship besides doing what they love. It’s a community initiative giving back to the community. That is what makes the group so special. They meet every fortnight either on a Monday at 10am or a Saturday at 2pm so that we accomodate all involved (whether they work or are housewuves or retired) We will speak to the Craft&Coffee group regarding your request and get back to you.